These little bad boys are so dang good. I usually eat them over grilled chicken or over pasta. My father in law loves them over striped bass....I will cook the fish but I defiantly wont ever eat it. Sorry not a fish fan. I can't do it. I have found anything I ate in abundance as a child I can no longer eat today. I'm weird I know. Give these a try they won't disappoint. Preheat oven to 450 degrees F (230 degrees C). Place a piece of aluminum foil over a baking sheet. Place the tomatoes and garlic into a mixing bowl. Drizzle with olive oil, and toss until evenly coated. Season with salt and pepper, basil and oregano (and crushed red pepper if you want a little kick), then spread the tomato mixture evenly onto the prepared baking sheet. Shared over at Weekend Potluck. This looks lovely. Dinner is served! I too love these little bad boys... try this for a variation.. roast halved small tomatoes at 100 deg C for 3 hours.... juicy and intense! :) Nice photo! Oh I do! I made them last night with my Roast Beef sammies! Oh, YUM! As soon as I read the title, I knew we were in for a treat! I just love oven roasted tomatoes! The photo is stunning, too! BRAVO! garlicy basily roasted tomatoes sound awesome! Lately I've been craving tomatoes in every possible form...in salad, stir fry, pasta sauce. 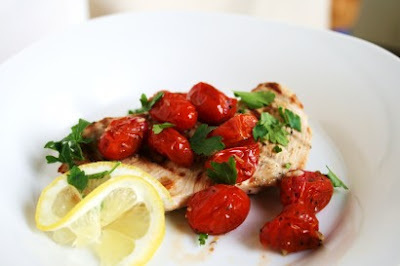 Your recipe looks delicious and an awesome pairing with chicken or fish! Oh goody! I just bought a big basket of grape tomatoes from Costco and this is a great way to use some of them. This looks delicious!